9 In 1 USB C HUB Expansion 3xUSB 3.0 Ports,2 x HDMI 4K@30Hz, 1x RJ45 1000M Ethernet port, 1xSDHC, 1xMicro SDHC, 1xUSB-C female port for charging, you can upload and download videos and other files very quickly.And our 9 in 1 type c adapter can connect to hard disk,keyboard, mouse, headset and so on. 4K HDMI Adapter: 2x 4K HDMI ports support up to 4K @ 30Hz,connect an HDMI cable from the pro hub adapter to your external monitor to view crystal-clear display.Enjoy high-definition displays and movies in your work and life. Fashion Design & Slim: Using mainstream color aluminum enclosure,intimate dimension design brings you convenient,you can carry it to anywhere you go. 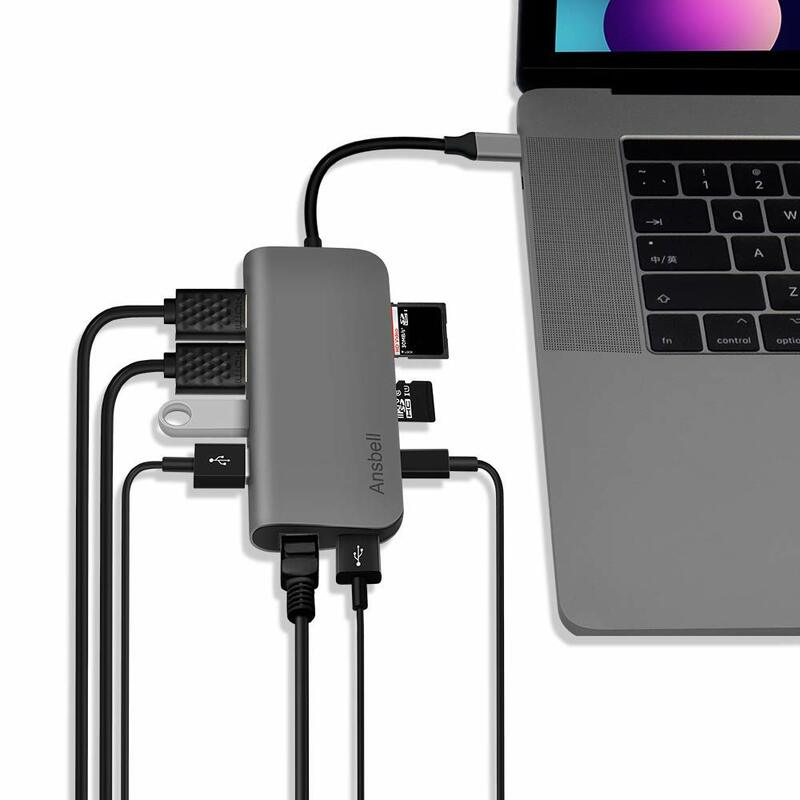 Applicable devices: It does not require any software,our 9 in 1 Type-C USB Hub have perfect companion for your MacBook/MacBook Pro and other compatible USB Type-C devices. Warranty Service: Our 9 in 1 USB C Adapters are high quality. Please do not worry when you have questions or unsatisfied of your order,because we can guarantee 12 months money back and quality warranty.